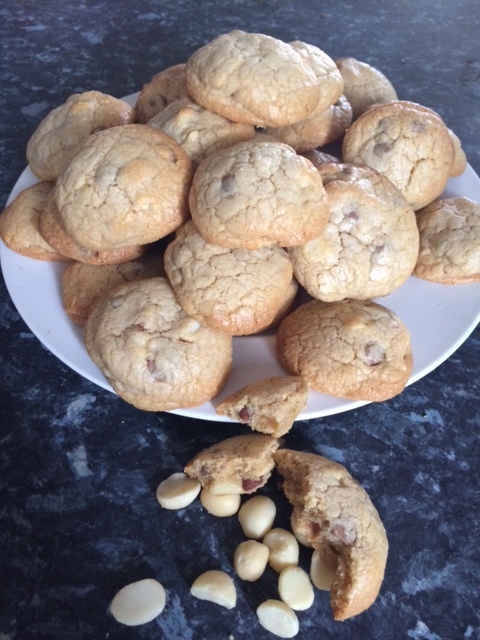 Crisp on the outside, chewy on the inside, white chocolate and macadamias. What more you could ask for in a cookie? This is a huge recipe – not in time or effort, but certainly in the amount of cookies you’ll have left to devour once it’s done. My family of boys can manage a double batch without a problem, you (and Bel) might decide to half the amounts I’ve given here. 1 cup of softened butter. No, not margarine. Butter. ¾ cup of brown sugar, packed. 2 tsp of vanilla extract. 3 cups of plain flour. 1 ½ tsp baking soda. Pre heat your oven to a low 140 c. In a large bowl, beat together butter, sugars and vanilla extract until it turns fluffy and takes on a lighter colour. An electric mixer will make your life easier, but it’s not essential for this recipe. Then add eggs one at a time. The mixture might appear to curdle at first, but it will come together. In a second bowl, mix flour, baking soda and salt. Gradually add this mix to the butter and egg mixture until all combined. It’s seriously easy to end up in a big mess with flour flying everywhere if you don’t take your time with this bit. Go on…ask me how I know! Or, maybe don’t. Add the chocolate chips and macadamia nuts at this point. You might want to get your hands in there to mix until pretty much even. Line a baking tray or three with baking paper (my favourite thing in the kitchen, saves on washing up). Spoon one tablespoon of mix into balls in your hands, then place on tray. Don’t place too close together, as they WILL spread. 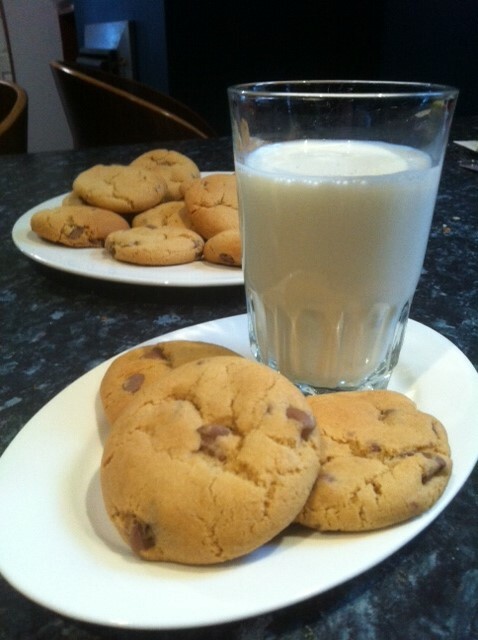 Cooking time is only about ten to eleven minutes – you won’t think they’re ready yet, but look for the slight golden brown change in colour around the edge of your cookies. They’ll still be quite soft. Allow to cool for a minute or two, then slide off with a spatula. Overcook and you’ll lose that lovely chewy consistency. 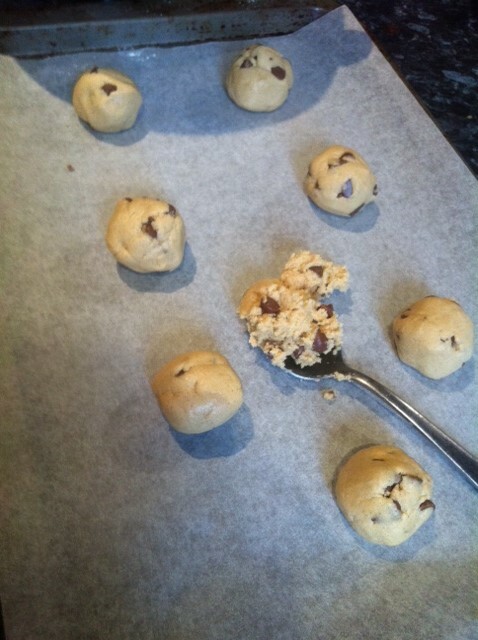 Of course, if you prefer your cookies with that bit more crunch, then by all means bake for a little longer. This recipe gets a huge work-out in our family. I’ve been making these cookies for years, and they disappear almost as quickly as they bake. Chewy in the middle, crunchy on the outside and just the right blend of vanilla and chocolate. And so, so yummy while they’re still warm! Preheat oven to about 140 degrees C.
In a large bowl, beat together the butter, sugars and vanilla essence until it lightens in colour and gets a kind of creamy texture. An electric mixer makes this bit easy. Add eggs, one at a time and continue mixing. Keep mixing until well combined, then add the chocolate chips. Mix until they’re evenly spread through the mixture. On a baking tray lined with baking paper (hey, we all hate cleaning up, right?) spoon balls around 1 tablespoon of mixture. Don’t place them too close together, because these suckers spread. I usually put seven to a large tray. Now comes the tricky bit – you need to cook them for LESS time than you’ll think. It only takes about 10 minutes for the cookies to change colour to a light golden brown, which is your signal to pull them out. They’ll still be super-soft, so let them cool for a minute or two, then use a spatula to transfer them carefully to a cooling tray. 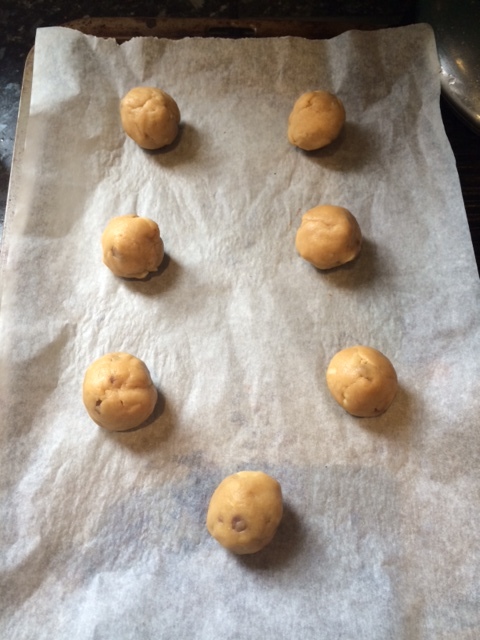 This recipe makes about 45 to 50 cookies – I dare you to eat just one!